Mothers who reported having the flu during pregnancy were at least twice as likely to have a child with autism as those who did not report having the flu, according to new survey results from a Danish study. While the study does not suggest that high fever -- or flu -- causes autism, many experts said the correlation reinforces recommendations that all pregnant women should get the flu shot. The study by researchers in Denmark and the U.S. Centers for Disease Control and Prevention looked at nearly 97,000 children ages 8 to 14 who were born in Denmark between 1997 and 2003, only 1 percent of whom were diagnosed with an autism spectrum disorder. The researchers interviewed the mothers during their pregnancy and after delivery about any infections and high fevers they'd experienced while pregnant, as well as whether they had used antibiotics. Although the study was not designed to ask about cases of the flu, mothers who reported having the flu during their pregnancy were two times more likely to have a child with autism, according to the study published Monday in the journal Pediatrics. Those whose fever persisted for a week or more before their third trimester were three times more likely to have a child on the autism spectrum, the study found. While the flu shot may prevent many cases of influenza, the findings did not suggest that getting the flu shot would have prevented the development of autism. "While it is very important to get an influenza shot during pregnancy, women who get the flu this winter should not worry that they have put their child at an increased risk of developing autism," said Dr. Richard Besser, ABC News' chief health and medical editor. The interview with the mothers included more than 200 questions that sought information about many different types of infections during pregnancy. "We consider this study to be exploratory," said Dr. Colleen Boyle, director of the National Center on Birth Defects and Developmental Disabilities. Boyle was not involved in the study. The study also found that some mothers who reported taking one type of antibiotics called macrolides, more commonly known by names like azithromycin or erythromycin, had only a slight increase in risk. Studies in animals have shown that the baby's brain is affected when a female's immune response is triggered during pregnancy, such as fighting an infection. These initial findings suggest a mother's immune system may play some role in a baby's development, though not nearly as strong as the association found in animal studies, according to some experts. "This is an interesting article, because of the increasing basic science evidence that some cases of autism may be related to immunologic factors that affect fetal brain development in susceptible children," said Dr. Susan Hyman, chairwoman of the American Academy of Pediatrics subcommittee on autism. Hyman was not involved in the study. The researchers did not find a link between infections in the urinary tract, bladder and genital infections and autism. The correlations that were found are not enough to point the finger at any condition during pregnancy as a contributing factor to the child's development of autism, according to Dr. Shlomo Shinnar, professor of neurology, pediatrics and epidemiology and population health at Albert Einstein College of Medicine in New York. "It can be very destructive when parts of the family, both immediate and extended, 'blame' the mother's mild illness that had little to do with anything for the child's condition," said Shinnar. Because many adjustments were made during the study and the researchers relied on responses from the women rather than medical records, the study could not provide a definitive link between the flu or a persisting high fever and autism, the researchers said. "Any episode of fever may be mistaken for influenza, and not all women infected with influenza virus might have been aware of this," the researchers wrote. "The association between antibiotics and autism is a novel finding, which requires confirmation." Not all cases of high fever require antibiotics, said Hyman. "Clinicians caring for pregnant women should use antibiotics judiciously for suspected bacterial illness," said Hyman. "Antibiotics are not necessary for the common cold and uncomplicated viral infections." Although many medications are off-limits during pregnancy, pregnant women with high fever or the flu should consult with their physician about the right course of treatment, especially natural products that are advertised to boost immunity, Hyman said. "Pregnant women who have a mild viral illness should respond with conventional care," said Hyman. 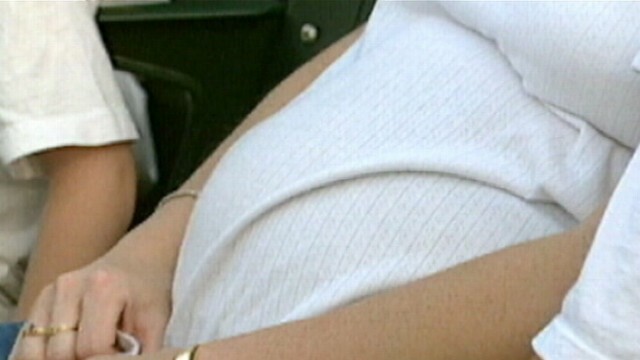 "High doses of some supplements and unregulated products may have other effects on the fetus." In general, women can build their immunity by simply getting the flu shot, according to Boyle. The shot not only protect the mother against certain strains of the flu, but also protects the baby for up to six months after birth. "This is flu vaccine season so pregnant women should get the flu vaccine immediately," said Boyle. +Does Stress Hurt Your Pregnancy Chances?